← Somatosphere readers: we welcome your contributions! I have been intending to return and continue the two lines of discussion I had started earlier concerning the broader theme of political subjectivity and the more specific issue of metonymic and metaphoric functions for a while now, but too many things stopped me from doing so. Thankfully a recent comment/question by Malte about my earlier posting on metaphor and metonymy offered me the reason to come back and write. I hope this short text will be the first of a new set of further discussions around the theme of subjectivity, and specifically a discussion of the central roles of meaning and power in the formation of subjectivity, which I intend to address under the rubric of political subjectivity. Malte’s main question was how we can understand the fact that despite what Lacan describes as the infinite slippage of signifiers (on the metonymic axis) we are able to think and act as if signifiers were either actually attached to a signified or bound by some kind of a border that keeps them from the infinite sliding that would normally be experienced as or called psychotic. Let me start with the straight forward answer to this problem, which will also be useful for us to eventually segue back to talk more about the metaphor/metonymy topic. The basic answer to Malte’s question comes directly from Lacan, in the form of the metaphor of quilting points or ‘points de capiton’. Points de capiton do what they do, i.e. stabilize or anchor meaning systems, by introducing ad-hoc “centers” into the system in the absence of Logos. They manage to do so by effectively producing a knot or tie in the (horizontal) chain of signifiers through the (vertical) metaphoric function. In other words, not too different from the upholstery pin that holds the horizontal structure (the temporal system of signifiers, the metonymic register) together by the virtue of a vertical tie (an atemporal harkening or invocation, the metaphoric function). Here S and S’ stand for two signifiers within the chain of signification (which flows from S to S’, unfolding in time), while delta (∆) stands for the pre-symbolized subject and the barred S ($) stands for the subject of meaning, or subject of the symbolic order. 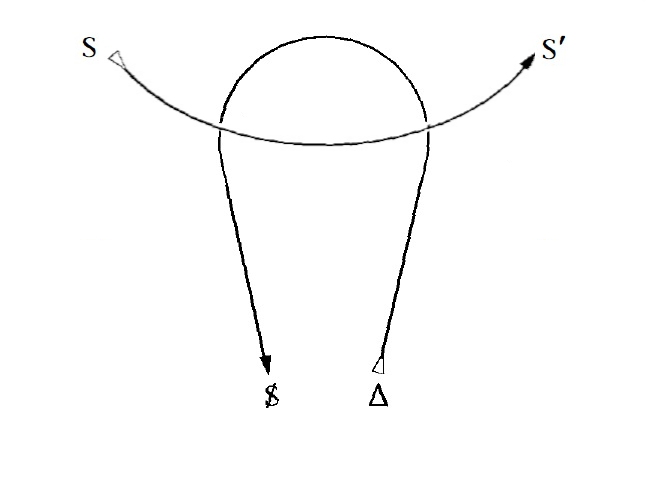 As indicated by the directions of the two vectors, while the metonymic vector flows “forward”, the metaphoric function rises to cross the metonymic plane (bridging, as it were, the imaginary and the symbolic registers), and then flows backwards (in time, which holds within the symbolic only) and downwards. The “backward” direction of the metaphoric vector can be interpreted to stand for two features of metaphor: a) that it “lends” or “inspires” meaning retroactively within the unfolding (metonymic) chain of signifiers, and b) that it “harks” back to the lost object. Notice that Object petit a (which is an important notion for our discussion and I will very likely come back to it in later posts), is for Lacan the pivot around which this turn of the metaphoric function and its dance with the metonymic vector takes shape. Object petit a, in other words, is a “solid” (as concrete as psychological phenomena can be) spot introduced into the psychic apparatus from “the Other” (language, etc.) and around which desire and meaning are spun. It is in this context that we need to locate and understand the two fundamental and fundamentally distinct functions of the metonymic and the metaphoric processes: while the metonymic force flows, unfolds or “pushes” forward and up, the metaphoric force draws or “pulls” backward and down. With a strong warning that what I am saying here must not be read in a literal sense, let me say a bit more on these two functions (I would invite anybody interested in a more detailed discussion of this to read my upcoming paper on the pantemporality of psychic events). The so-called forces that I just attributed to metaphoric and metonymic functions are in fact associated with very fundamental processes that appear in a variety of guises in diverse discourses (again, I will hopefully have a more detailed discussion of this idea in a later post). In the most basic sense, you can think of these in terms of their expressions vis a vis “the lost object”: they both “promise” a return to or regaining of the lost object, but they each offer that in a different modality. The metonymic process “promises” the reunification through symbolic representation/discovery, while the metaphoric process offers the promise of reunification through some kind of a direct return or contact with the original thing. These basic features explain much of the differences in function and dynamics associated with either of these two poles and the “force” identified with each. To use a very basic analogy, think of the difference between the typical religious reference to and nostalgia for a lost state of blissful unity with God to which the pious long and hope to return, versus the range of modernist promises for a utopian future for achieving which the believer needs to struggle (whether through scientific effort or revolutionary dedication, etc.). While the metonymic push leads to a ceaseless process of unfolding, expansion and complexification within the symbolic order, the metaphoric pull leads to a multi-layering of meaning imbued with poetic (nostalgic) depth and paranoid ambiguity. To put it differently, if the metonymic force is associated with “up and forward” oriented manic defense, the metaphoric force is associated with “down and backward” oriented melancholic identification (you might want to see Winnicott’s wonderful paper, “The Manic Defence” on the manic/depressive poles and their clinical and symbolic manifestations). These two forces should indeed be understood as the most centrally defining features of the metonymic and metaphoric functions that work together to make possible the fundamental features of subjectivity, namely meaning (and hence desire and power) and temporality. The metaphoric function, which as I just mentioned promises a direct (albeit illusory) connection to the lost object, melds with the metonymic function to on the one hand introduce into the chain of signification an (illusory) experience of meaning or reference to a signified, and on the other hand inspire (by helping bring to existence object a) desire, which then “flows” endlessly through the chain of signifiers. This so-called melding and the associated processes take place around the ad-hoc and illusory point of reference that Lacan has termed objet petit a, which is simultaneously an anchor at the center of point de capiton and a source of movement as “object cause of desire” for the system. There are just too many tempting directions and topics in this discussion to possibly address adequately in a single post, so I will stop here, hoping that my answer has at least addressed the question raised by Malte, and hoping also to continue with this discussion shortly, specifically insofar as it connects us to the central issues of meaning, power and political subjectivity. As always, looking forward to your comments and questions. Rahimi S. Subjectivity at the Intersection of Metaphoric and Metonymic Functions. Somatosphere. 2012. Available at: http://somatosphere.net/2012/subjectivity-at-the-intersection-of-metaphoric-and-metonymic-functions.html/. Accessed April 25, 2019. Rahimi, Sadeq. 2012. Subjectivity at the Intersection of Metaphoric and Metonymic Functions. Somatosphere. http://somatosphere.net/2012/subjectivity-at-the-intersection-of-metaphoric-and-metonymic-functions.html/ (accessed April 25, 2019). Something I found really helpful in approaching Lacan’s use of structural linguistics is the differentiation he makes between the ‘subject of the statement’ and the ‘subject of the enunciation’. The former is designated in the ‘I’ of the linguistic utterance, but, as Lacan points out in ‘The Subversion of the Subject’, it does not ‘signify’ the subject per se. In order to for that to happen, as your post lucidly explains, the subject (of the enunciation or, broadly speaking, the unconscious and presumably the locus of political subjectivity) has to be ‘quilted’ into the discourse (the button tie indicating the process by which the subject of the unconscious is smuggled into the speech act). The point here being that while any sentence unfolds according to the Jakobsonian axes of selection and combination, in order for the subject to be introduced via the button tie there has to be a specific kind of metaphorical function at work, and this, as I understand it, is a fundamental diagnostic question since psychotic subjects may be able to ‘use’ metaphor, but not to ‘metaphorise’ themselves (the subject of the unconscious) into discourse. Anyway, those were my thoughts on reading your excellent post. Hello Quesalid, and thank you for your great comment. The points you have raised are absolutely important and I very much hope for us to get to discuss them in some depth in future posts. Receiving this kind of reflection and comments and knowing that there are others here/out there who find these discussions useful and relevant is a very significant encouragement for continuing with this project, and I hope that you and others who like yourself have a close understanding of and interest in Lacan’s work and its anthropological implications continue to provide me and other readers with their input and ideas. As for a sustained micro-level Lacanian approach to ethnographic analysis, I would also be interested in learning whether there are works out there that I do not know about. My own work on psychosis and culture/history in many ways lends itself directly to these discussions, but my analyses were not done following a strictly speaking “Lacanian” methodology either. That being said, I am nonetheless planning to bring some of that data here eventually (once I feel we’ve developed a basic platform) and discuss it in the framework of what we are developing here. And again, I very much count on feedback and input from the readers in working my way towards that. I have to admit, this notion and process of developing a line of ideas through blogging is quite new to me, and a very intriguing one in terms of its dynamics, its implications and its potentials and pitfalls. In fact there are two things happening here for me, one is of course the chance to discuss these topics of interest in an open on-demand public forum, and the other is discovering what this forum is, how it works and where it can take me/us. and a hole which hide or generate the meaning. I would simply like to express my gratitude to someone dedicating their time to enlighten faceless strangers in a clear and non-proud way. It’s very nice to stumble upon. I can’t help but feel you have the metaphorical and metonymical in reverse order to how I understand those functions and I’d really appreciate it if you could set me straight. You say , the metaphorical function, promises a direct connection to the lost object. To me that is the metonymical function which is what take the partial object and fetishistically induces towards the whole. THis is the promise of direct access to the object. On the other hand the metaphorical, must be more linked to language and the signifying chain, because a metaphor is all about how the object can be symbolised in a multiplicity of different ways. Thus the metaphorical instinct is constantly looking for different signifying chains to attach to the world in the hope that one will finally “fit” correctly and thereby adequately signify and allow access to the lost object. In order to answer this question, you would have to refer to the sense in which these terms are applied in reference to the signifying chain. The common literary distinction (metaphor/metonymy) collapses the symbolic and the real when it assumes that a word or concept reflects the ‘whole’ which, as you say, metonymy ‘induces’.